Time Bucks Review – Is TimeBucks A Scam Or Actually Worth Your Time? Have you ever wanted to join a “Get Paid To” site that actually pays in cash rather than gift cards? Well, with Timebucks, you get exactly that! In this Timebucks review, I’m going to answer the question tons of people have been asking, “Is TimeBucks A Scam?”. 1 – What Is TimeBucks? 2 – How Does TimeBucks Work? 3 – How To Get Started? 4 – How Much Can You Really Make With TimeBucks? 7 – How To Make Extra Money With TimeBucks? 10 – Final Thoughts – Is TimeBucks A Scam? 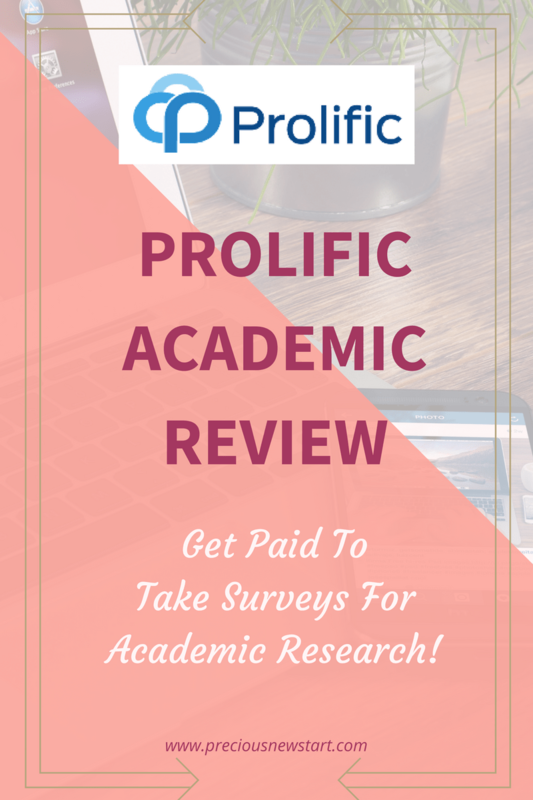 Prolific Academic Review – Get Paid To Take Surveys For Academic Research! In my search to find genuine and legitimate ways to make money online I came across a site that has a unique way for allowing you to earn money through taking surveys. It definitely differs from other survey sites I’ve used in the past, and as you continue to read my Prolific Academic Review you’ll find out why. Prolific Academic is a site that allows you to participate in surveys and studies for academic research and is supported by Oxford University. Genuine researchers upload their studies onto the site in order to get the right participants…you…to be involved in their study. As a participant, you are rewarded for taking part. It’s quite easy to get started with Prolific Academic. 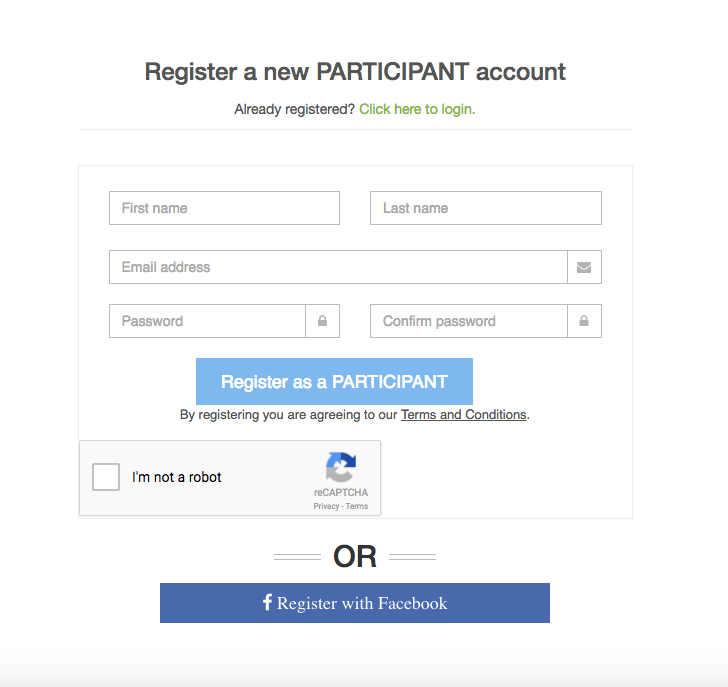 Once you’ve opened the site via the link above you click on “Sign up as a participant” to create your account. You can also choose to sign up via Facebook. When you’ve signed up, follow the instructions to set up your account. You’ll need to verify your account with your email address and phone number, and you can also verify using Facebook if you wish. (You get more information as you set things up). In case you’re wondering, the phone number is only for verification purposes and since signing up I have not received any marketing texts from them at all. 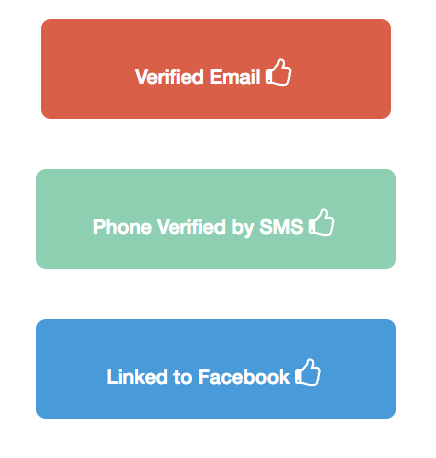 Furthermore, you’re asked to verify your account in order to build trust within their community. Once you’ve verified your account you’ll be able to complete your profile by answering some short and simple pre-screening questions. 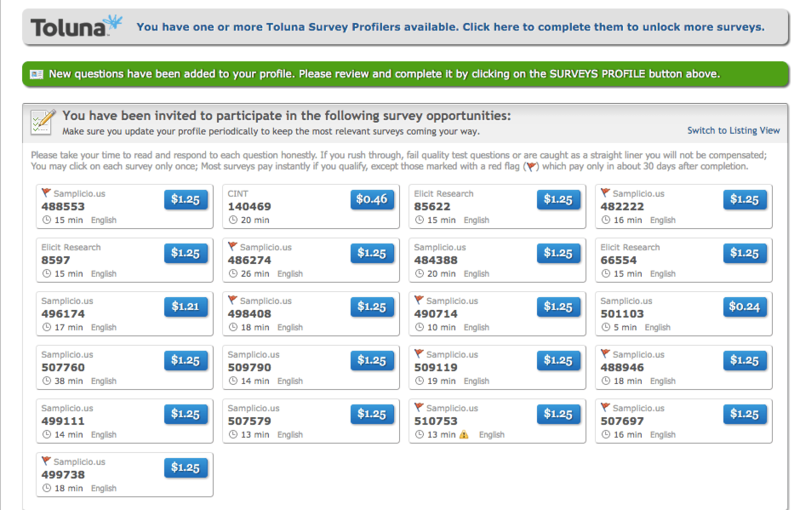 By building your profile you’ll be given more eligible surveys. Furthermore, in order to receive payments, you’ll be able to add your Paypal email to your account. What Makes Prolific Academic Different To Other Survey Sites? Unfortunately, with most survey sites, you get started with the survey only to find out minutes later that you don’t actually qualify. Well, Prolific Academic will give you surveys that you are eligible for, and in my experience, I’ve never been stopped from completing a survey due to ineligibility. With Prolific Academic, you get to be involved in scientific and academic research. As someone who studied a science-based course at University, I do find it quite exciting and inspiring to be a part of someone else’s research in this way, and then to get a rewarded for it. I’ve personally found the surveys to be more interesting than surveys you get from most other paid survey sites. This is definitely something that makes Prolific Academic unique in my opinion. You can choose to donate the money you earn to charities online. You could be doing good for your community as well as helping a fellow academic in their research. The surveys and studies here are by genuine university students and researchers, so you need to pay attention to your responses and make sure you’re giving as accurate information as you can in order to get rewarded for your time. Luckily the surveys are quite interesting and so it’s not too difficult to stay engaged in the study. In the “Studies” section you’ll be able to see what surveys are available and what surveys you are eligible for. You get to see if you qualify for a survey even before you start it. This means you don’t waste time filling out long-winded pre-screening surveys that lock you out halfway through because you didn’t qualify. This shows that the studies are created by real students who are looking for genuine participants for their research. This personally made me feel more comfortable getting involved with the site. One of the things I like about Prolific Academic is that they provide an estimated time of how long it’ll take to complete the survey. Many times you’ll be able to complete it sooner, but at least you can see how long it might take. You only need to reach £5 before you can cash out which is quite low and you can make that quite quickly. One thing to note is that there is a payment fee taken when you cash out anything less than £20, so I’d personally recommend you wait until you’ve reached £20 to avoid any PayPal fees. As mentioned previously, Prolific Academic are very good are giving you surveys/studies that you always qualify for. I have never been locked out of a survey because I didn’t qualify, which is a common theme with most survey sites. So I’m glad that I’ve never had this problem, and it’s been like that for most (if not all) users of Prolific Academic. One of the things I like about Prolific Academic is that you can earn money for charity. So you can choose if you want to earn the money for yourself or if you want to donate it. Most times you’ll receive email updates of new surveys, but sometimes there are studies that are filled before emails can be sent out, so you may not always have surveys available. One way around this is by visiting the site one or two times a day to see if there are any new studies available. As they are looking for specific demographics you may not always be eligible for the current surveys, but it’s always good to check in every once in a while as there are new studies being posted daily. In regards to how much you’ll earn, you can generally expect to earn between £0.30 – £2 per survey, and I’ve personally seen some studies pay up to £4 each. I’ve included a screenshot of my payment proof to Paypal, just to show you that this site is legit and a genuine way to make some money online. I was able to cash out £20.41 and received payment within a few days. UPDATE 2017: Prolific has now added Circle as a cashout method. Paypal payments require a 2.9% + 20p transaction fee. But with Circle, there is no fee involved once you reach £20. See below for payment proof using Circle. Overall I think Prolific Academic is a good legitimate site to use if you’re looking to make some additional money online. It differs from most survey sites in a positive way, which is why it’s one of my favourite sites to earn money from. Do I Recommend Prolific Academic? YES! It’s really easy to get started and a nice way to supplement your income, while also helping academics with their research. I also like the idea of being able to donate your earnings for charity, and I think this is a really great touch. If you’re interested in another recommended survey site of mine, check out my Mintvine review. What are your thoughts on my Prolific Academic review? Have you used this site before to make money online? What do you think about being able to help academic research and donate your earnings for charity? Feel free to share your comments and/or questions in the section below. Clixsense Review 2016 – Is It The Best Paid To Click Website? UPDATE July 2017: Unfortunately, you can no longer earn via the Paid To Click (PTC) ads and Clixgrid methods. 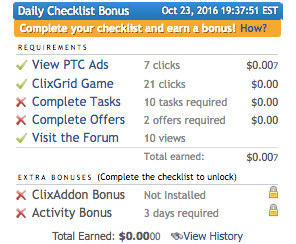 Clixsense is a Paid To Click (PTC) site that’s been running since 2007 and pays it’s users for completing different tasks online. Some tasks include viewing ads, surveys, playing games and completing offers. It’s very easy to get started with Clixsense as it’s free to join and simple to create an account. Once you’ve signed up you can begin earning right away. Can You Really Make Money Online With Clixsense? You’re probably wondering if you can really make money online with Clixsense, and the answer is Yes, you can…however, I wouldn’t want you to quit your day job as the the amount you earn isn’t going to make you rich in any way. For the most part you’ll be earning pennies to view website ads and complete tasks. Although it doesn’t have high payouts, it is a genuine way to make some money online, and I will discuss the multiple ways to earn below. Are you interested in starting an online business? Take a look at my #1 recommended training program to help you get started! 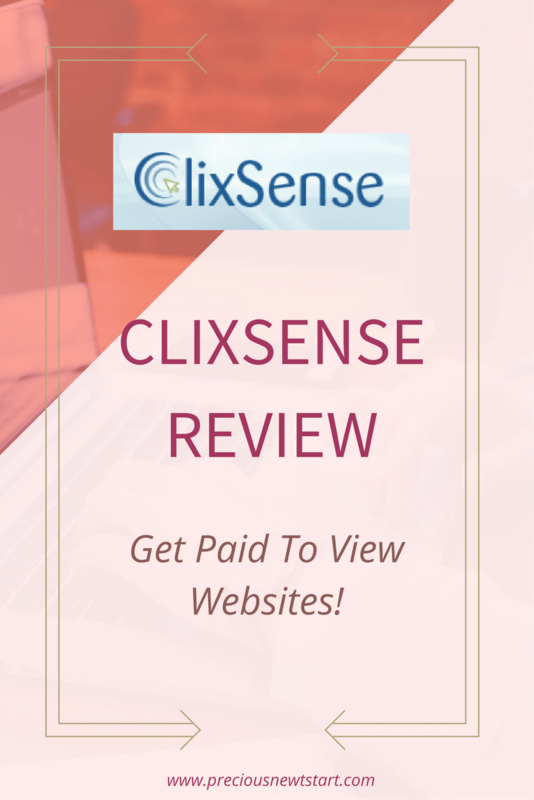 The main way people earn from Clixsense is by viewing ads. It’s the fastest and simplest way to earn money on the site and ads usually last between 5-60 seconds. 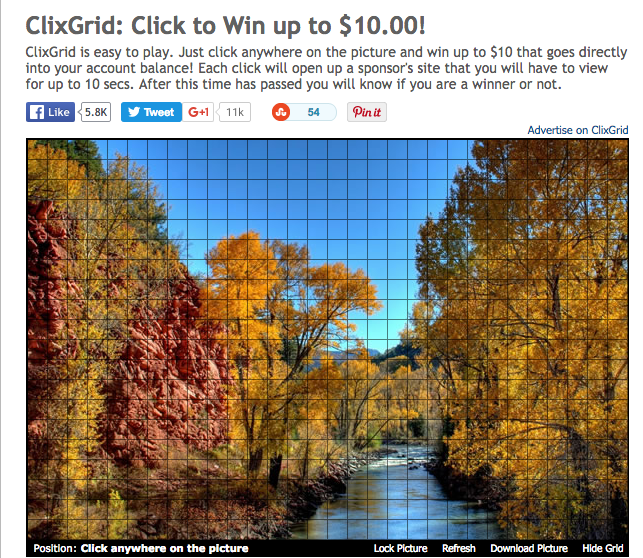 Clixgrid is a grid game whereby you click on random squares within the grid in hopes of winning up to $10. With each square you click you’ll have to view a 10 second ad. After viewing the ad you’ll find out if you’re a winner or not. If you’re not a winner then you won’t earn anything. So a bit of a gamble for your time if you don’t win anything. Most of the recent winners only won about $0.10 or $0.25, which isn’t very much for the amount of time you spend on the grid. You get 30 chances a day to try and win. I’ve spent some time doing this and unfortunately I’ve never won anything from it so far. Another way to earn money with Clixsense is by completing surveys. You’ll be prompted to complete a survey profile, which is just questions that you’ll need to answer about yourself. The aim of this is to provide you with surveys that fit your demographic and to fit you with surveys you’ll qualify for. However, based on other users review, you’ll still be presented with many surveys that you won’t qualify for, despite filing out the survey profile. So it’s possible you’ll spend ages completing the qualification questions and then finding out that you don’t actually qualify for that survey…that’s a complete waste of your time and you don’t get reward at all for that time. I personally haven’t tried using the surveys on Clixsense to make money. I tried many years ago, but remember not being very successful with it, so I decided not to even bother with surveys when trying the website out again this time around. You can also earn money by completing microtasks with Crowdflower. You’ll need to create a Crowdflower account, but you can sign up through Clixsense and it doesn’t take too long. You’ll be presented with different tasks, but when you first get started the earning potential will be very low. My first task was only paying $0.02, and I was required to transcribe audio. As you complete more and more tasks, you’ll move up the different levels. As you move up the levels you’ll have the chance to earn more from the tasks. So if you want to use this method for making money it’s encouraged that you stick to it as much as you can at the beginning, as you’ll start seeing better rewards as you move up the levels. I’ve seen some reviews of people making up to $40-50 from microtasks alone…once they’ve reached the higher levels. Below is an image that shows some potential jobs that are available. As you can see, you have to be at a certain level to complete a few of these tasks. I’ve only recently begun looking at the “Tasks” section of Clixsense, so I haven’t achieved the levels yet. If I have any new updates regarding microtasks I’ll add them here. You can earn extra by completing offers which include signing up to websites, taking surveys, entering competitions etc. Clixsense has a daily checklist to help you earn money on a daily basis. This is a good way to earn something everyday, and you can keep track of how much you need to do, and how much you’ve earned for that day. If you can keep up with this on a daily basis, then you could make a nice little bit of money. Clixsense has some games that can be played on the site, however you can not make money by playing these games, they’re just for you to enjoy. I think these can be entertaining to play every now and again. This is a tool that sends notification of any new tasks or offers that you can complete. It can be downloaded for Google Chrome, Firefox and Opera browsers. With this tool it’s more likely that you’ll get more PTC ads and get earlier access to surveys and tasks, because you’ll be notified of them sooner than other members. So, Is Clixsense a Scam? Although the earning potential of Clixsense is quite low, it is definitely NOT a scam. Clixsense is a legitimate website, and a real way to make some money online. Clixsense is completely free to join, and you can remain a free member as long as you want. There’s an option to upgrade to premium if you feel you will benefit from being a premium member, which will cost you $17. Some premium users have mentioned having more earning opportunities (i.e. more ads to view), which looks about right based on the screenshot below. More chance to win Clixgrid. This is because you’re given 60 chances as a premium member vs 30 chances as a free member. I’d recommend that you only upgrade if you believe/know you’ll be able to get many referrals, and stay up to date with the daily checklist. If you’re not likely to make more than $17 a year then it’s not going to be worth the membership fee. Anyone who may be looking to make some extra money online. But I would recommend that you don’t spend hours and hours on the site. Those not interested in PTC sites. – If you don’t like spending time clicking through ads…especially for pennies, then this website is not for you. Those who want to earn more than a few pennies online. If you’re someone who wants to have a bigger earning potential then Clixsense will not be for you. A good alternative would be to start your own online business. Clixsense has been running since 2007 and has been successfully paying members since. They’re a good company, and would be my recommended PTC site for anyone thats interested in earning with this method. Clixsense pays its members via Paypal, which I’m glad about. You can also cash out with other payment platforms such as Payza and Neteller. You can interact with other Clixsense members within the forum, and take a look at different success stories and payment proofs. To earn any decent amount on Clixsense you have to spend a lot of time completing tasks. If you’re not completing surveys, then you might have trouble reaching the $8 threshold…unless you’re lucky enough to win $10 on Clixgrid. Considering you’re paid between $0.001-$0.01 for clicking ads it will probably take a long time to reach that threshold. The best way to earn more is to take part in all the different earning methods. If you really want to boost your earnings, then you could consider signing up to premium. It’s $17 a year, but you’ll be able to earn more than a free user. This is probably the best way to earn more with Clixsense, and it’s the method that most Clixsense members use to maximise their earnings. The referrals would have to be active in order for you to earn. So the more referrals you have, the more likely you are to earn more money. If you haven’t heard of Buxenger before, it’s basically a very useful app that allows you to speed up your earnings from viewing ads. You can also use it to manage your Clixsense account and any other PTC accounts you have more effectively. It’s free to join, with the option to upgrade for only $2 a month. This app won’t necessarily make you earn more, but it’ll allow you to earn faster, therefore saving you time to do other things. In order to understand it better feel free to watch the tutorial video below. 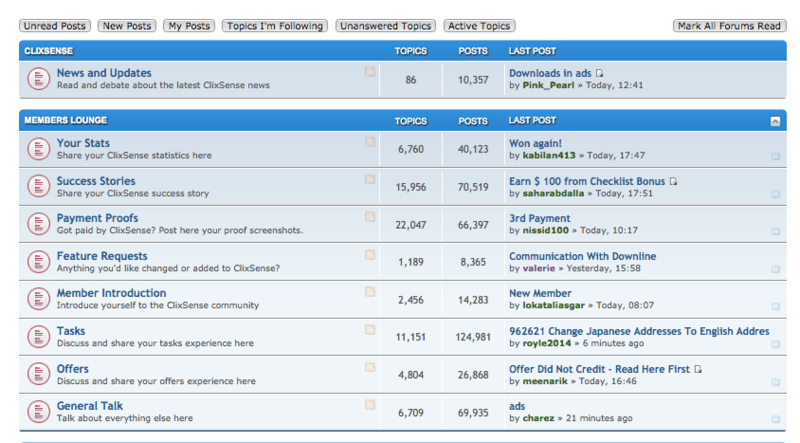 Overall, Clixsense is a legit website that allows you to earn some money online…but don’t expect to get rich with it. As you can probably tell, I don’t think it’s something to spend a lot of time on. Maybe you can find ways to make use of the site to fit in with your day to day activities without wasting too much of your time. For example, you can view ads or use Clixgrid during TV ad breaks. As you can see, it’s very low paying and not really worth a lot of effort. Instead, you could use your time to build an online business. That’s what I do, and I have a free online business training program that you can join to help you get started. Is Clixsense the best PTC website? Personally, I think it is one of the best PTC sites to earn money from. Although you won’t earn a lot for viewing sites, you still have multiple other ways to earn from the site. Ultimately, if you work hard enough with Clixsense there’s still a good opportunity to earn some decent money from it. So if you feel you can make it work then I’d recommend you give it go. What are your thoughts on Clixsense? 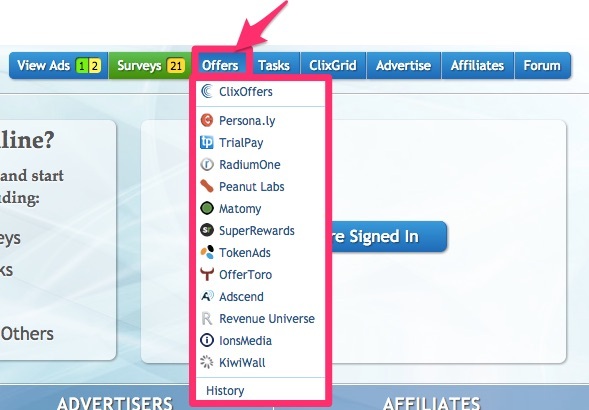 Do you use Clixsense to earn some extra money online? Is it the best PTC website for you? Feel free to share your experiences and/or success stories in the comments below. OfferNation Review: What Is OfferNation? While looking for ways to make money online I came across a website called OfferNation.com. I spent a little time using the website in order to test it out and find out if OfferNation is legit. I will share my thoughts on the website, as well as my payment proof. Hopefully, the information I provide will help you decide if this website is a good way for you to make some extra money online. If you’re looking for a quality OfferNation review, then you’ve come to the right place! Also, are you interested in starting an online business? Take a look at my #1 recommended training program to help you get started! OfferNation is a Get Paid To (GPT) site that’s been online since 2013. A GPT site is a website that provides multiple ways to earn money online by doing different tasks. Most GPT sites involve completing surveys, clicking ads, sign up for offers, watching videos etc. This is the most profitable way to make money online with OfferNation, because the surveys offer higher payouts. You can see from the image below that you are told how much the offer will pay, and the instructions of what you need to do in order to receive the payment. You’ll also get a list of Top surveys and some New surveys that are available to complete. There are many offers available that you can complete. You can find them in the “OfferWalls” tab at the top. Each offer awards you in points, rather than cash. However, the points you earn can be converted into cash if you like. The offers that usually award higher points, tend to involve making a payment. I personally stay away from those types of offers, but you can still earn from the if you’d like. Some of the offers at “OfferWall” also have additional surveys that can be completed for higher paying rewards. With OfferNation you can also get paid to watch videos, but not many points are awarded for doing so. However, at least this option is there if it’s something you would like to do to earn points. With this method, you can earn some points by clicking on ads. The earning potential is very low with this method, as some ads pay as low as $0.0009, which is almost useless in my opinion. (I guess it’s good if you’ve got an ad to advertise though, due to its low cost). There are some that offer higher amounts, but overall, it’s still pretty low. 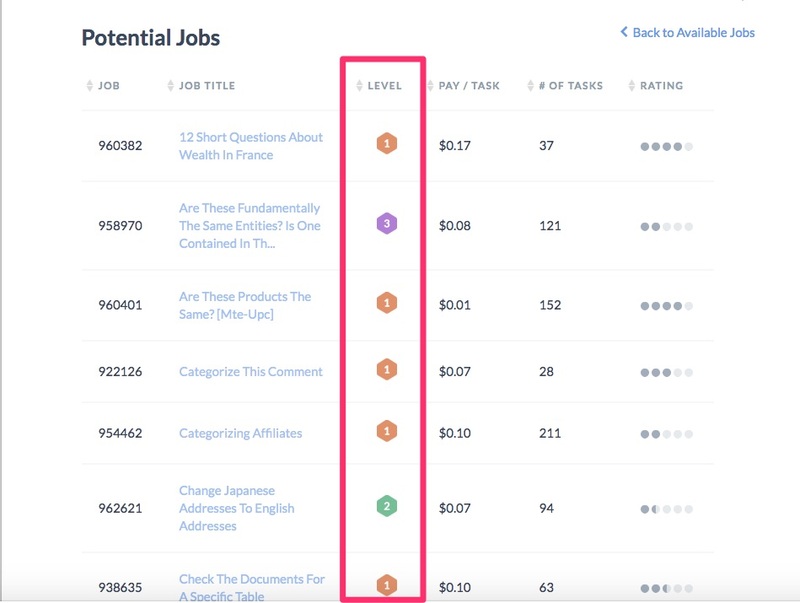 You’re able to get paid to search with this website. They pay you up to $0.018 for each search you do. There are instructions about what specific keywords you need to search for in order to get rewarded. I seemed to have a few problems finding the websites with the search terms. I’m not sure if one of the reasons is because my Google browser would automatically set to .co.uk instead of .com. In the end, I wasn’t able to really earn with this method, but who knows, you may have better luck than me. Make sure you follow the instructions carefully and complete the task that is required in order to earn your reward. Most offers will be credited within 1 hour, however, some can take up to 24 hours, and a few have been known to take up to 30 days. Some advertisers will send an email for verification, so be sure to keep an eye on your inbox and verify any emails to receive your credit. Remembering to “Submit” the offer once you’ve completed it in full. Low payment threshold: You only need a minimum of $1 in order to cash out. Pays via Paypal: If you’re a regular reader, or you’ve browsed through my site, you’ll see that I’m a big fan of products/services that use Paypal . I just find it much easier to deal with than credit cards etc. Other payment methods are available, but Paypal is my favourite. Fast Payment: When I withdrew my cash I received it into my Paypal account within a few hours. Referral program: This means you are able to earn more money – up to 25% per active referral. You won’t know how long a survey will take before you decide to do it. You may end up answering lots of pre-qualifying questions before you find out you don’t qualify for the survey. Some offers just aren’t worth the points: For example, some of the pay to click ads reward as little as $0.0009, this is just way too low in my opinion. Don’t get sent emails of new surveys: Most survey sites I’ve joined send regular emails of new surveys to complete, however, OfferNation does not do this. Geotargeted Offers: Most of the offers available are for those in the USA, UK, Canada, Australia, Spain and Italy. This means that if you are from other countries, you may get less offers available to you. The offers are credited as either cash or points. Points are usually awarded for completing sign up offers. These points can then be converted into cash. The amount you earn depends on the offer you complete. This is a good site for anyone looking for a way to make a little extra money online. Maybe you’ve used other GPT sites and you’re looking for an alternative, if so, then this is a good option. You have multiple ways to earn, and you can probably find a method that works well for you. Note: If you’re looking for another quality survey site to make some extra money online, then I would highly recommend using Mintvine. It’s my favourite survey site because you can see how long a survey will take before you do it, and even if you don’t qualify for a survey, you can be awarded up to 30 points (30¢). If you’d like to know more about MintVine, then you can check out my review by clicking the link below. You May Also Like: Clixsense Review 2016 – The Best Paid To Click Website? Who is OfferNation NOT for? If you don’t like GPT sites or survey sites, then this website is definitely NOT for you. I know some of you just don’t want to spend your time doing offers and surveys, which I understand. So if that’s you, then I’d recommend NOT joining this site, as you probably won’t find it beneficial. If you’re looking for a more profitable income earner, I’d suggest starting an online business. If that’s something you’d be interested in I’d encourage you to check out my #1 recommended training program. They offer a help guide and a FAQs section to help you get started and understand the ways to make money with them. They offer a support ticket service which aims to contact you within 12 hours. I haven’t had to contact support, but if I do I can update my experience here. As soon as I reached the $1 threshold I decided to withdraw my cash and see if they pay out as fast as promised on the site. I am pleased to say that it does. I received my payment within a few hours straight to my PayPal account. The only downside is that they take 2% transaction fee when you withdraw to Paypal. However, I’m not sure if this is the case for other e-wallet vendors. You can also take a look at their payments proof page here, and you can see that people are cashing out payments on a daily basis. Yes – If you’re looking to make some extra money online through GPT sites. I think OfferNation has potential for earning money online as there are multiple ways that you can earn some money from this site. No – If you’re looking for a program that has more earning potential, and don’t want to spend your time completing online surveys/offers. OfferNation is a genuine way to make some additional money online. There are multiple ways to earn, and it’s totally free to join. If, however, you’re not interested in GPT sites, and you’d like to start an online business and making more money online, I would encourage you to check out my #1 recommended training program. This program will allow you to start an online business based on something you’re passionate about, which could lead to much higher earning potentials. Overall, OfferNation is a legit program, and good if you’re looking for a way to earn a little extra money online. I think it’s definitely worth a try, and you may find that OfferNation works well for you. Are you an active member of OfferNation? What have your experiences been? Have you made any money from it? Or are you new to this program, and interested in giving it a go? Feel free to share your comments and/or questions in the section below. If you found this review helpful, please feel free to share. I came across this exciting new website online that pays users to test new products online and share their opinions. The website is called ATryBox, and the good news is, it’s FREE to join. Basically ATryBox is a new NYC based company that connects tech companies with people who are willing, and able to test out their products. How Will You Get Notified Of New Products To Test? You will get sent invitations to new products via your email. You can choose to accept or decline the invitation. Usually bigger brands and startups might use this method as a way to get user opinions and feedback in real-time. Because it involves taking your time to commute, the price is open for you to decide how much you’ll want to be paid. With this method you will be providing feedback on things such as product design. It will usually take around 10-20 minutes to complete, but some can be up to 30 minutes. This is nice and easy because you get to pick your preference over features such as colour, logo, design, name etc. ATryBox is good for anyone who is looking to make some extra money online. If you enjoy giving your opinions and feedback, you can get paid to do so. What Can You Expect To Get When You Join? You get to choose the methods of testing you want to do. So if you’re someone who hates phone calls, but loves surveys, then you can decline a specific test. If you’re at home or travelling, all the tests (expect Personal Meetings), can be done remotely. You can expect to receive payments within 7 days of completing the test. Payment is made through Venmo. If you don’t have a Venmo account, then you can create one when you receive your first payment. Venmo is part of Paypal, and charges no commission, so you actually get what you earn. So if you’ve read this review and thought…”I’m ready to get started”, then click the link below to start making some extra money online. As I am not a US resident, I am unable to give you my own personal experiences with this website. However, I would really like to know what your experiences are, and whether you think it’s a good way to make some extra money online. It’s free to join so there’s nothing to lose. Please share them in the comments below. I really look forward to hearing your thoughts on this website…and hopefully soon it’ll be available internationally. If you’re international and know people in the US that you think might be interested, why not share this review with them and help them earn a little extra online. P.S. If you’re a brand and would like to get users to test your product, you can click this link to contact them about your product.